A portable or folding shelf is great for those unanticipated needs such as yard sale, Christmas or other times when you need to display or store things. 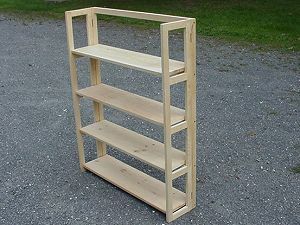 The folding shelf is a fairly simple woodworking project and uses a plate (biscuit) joiner for assembly. The unit pictured here was constructed from pine but most any wood may be used. You can stain and finish the shelf as you like but polyurethane is a good, tough, finish. Use safety glasses and hearing protection.